Take note that this data only considers the impact of capacity via Openreach’s national FTTC/VDSL2 network and not that of other platforms. Different networks handle different types of capacity issues in different ways and not all are as transparent about such issues. Likewise newer G.fast and FTTP services on Openreach’s network are not yet a factor above and we don’t imagine port capacity will be an issue for FTTP due to how it’s deployed. Unfortunately if you happen to live in such a “full to capacity” area then this can cause frustration when attempting to order a new FTTC package or migrating your service, particularly if the ISP accepts the order and begins the switch only to later tell you that they cannot complete it. Some providers can be quite appalling with how they handle these situations, but in other cases the ISP may simply be caught out by a sudden change in status (post-order). We should point out that in some cases Openreach’s may still need to build an entirely new cabinet in order to cater for rising demand, even though they will often manage to avoid this, which can be problematic due to labour / hardware costs, the need to seek planning permission, permits for road access, wayleave agreements, power supply requirements, local objections and so forth. Sadly TBB don’t give a consolidated figure for England, only lots of regional ones and you can find that on their page. Yeah I read their site and knew but it made me chuckle with the juxtaposition 🙂 London pretty much thinks its England anyway! England for those worried about it specifically is running at a 2% impact. everyone knew this would happen years ago… some pcp cab areas will need loads of fibre cabinets. it is all part of the superfarce. OR bung one in and declare the area is superfast fibre enabled. Yet the ‘fibre’ cabinet only serves a small proportion of the lines, and not the EO lines, so many don’t have superfast at all. (sighs) You know perfectly well the numbers of EO lines has fallen dramatically and continues to fall. There may be a temp spike in cabs but they will be declining dramatically as fib rolls out fully. @CC – Please name a cab area that will need loads of fibre cabs. 384 may be the cab max currently, you can check. @joe, yeah for EO lines they just stick you on a cabinet 2km away outside the exchange rather than one that is 30 metres away and with tax payer subsidy to do so. Seems a fair solution! 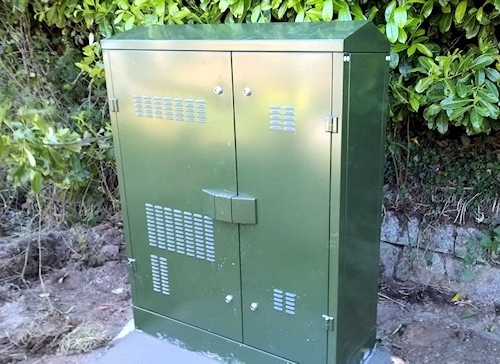 The reality is that while some EO lines do get added to cabinets at this sort of distance a good many others are well within the range of the new cabinet to superfast speeds. @Andrew Ferguson so why have openreach charged bduk to carry out this work? NOTE: Openreach can only charge in areas where it has been agreed they can charge the local BDUK project, i.e. what is defined within the contract. The BDUK contracts only pay out for premises that can get superfast speeds. Currently has 2 x 256 port ECI DSLAMs and 1 x 288 Huawei DSLAM. Long lines isn’t just a EO problem, in my instance the exchanges cabinets are located close to the exchange, so 4km from the cabinet, and 3km from the recent infill cabinet. FTTC was always going to be unsuitable for rural areas. that’s a laugh 30+ speeds in the uk yeah right open reach what that bodge up network . Nearer 80M for many. Dont hear any significant call for beyond that so the rollout of superfast benefited many quickly. CC will be praising the FibreFirst scheme. If you need more than 30Mbps then get a second line and load balance it or move to 4G. We know from customers’ experiences that this is often an unrealistic option. For many, even to get a meager 100Mbps upload often requires more than 5 VDSL lines. OpenReach in all too many cases simply won’t supply that many local loops to a premise. And load-balancing equipment was often unreliable. Not to talk about excessive real world cost of this option. Often it makes more sense for a small business to move to a better location. This is still a sad reality in this country with its broadband postcode lottery. My cabinet are in waiting list. Max, you have more names on here than a phonebook! It’s back available now, Max. Look like it will allow all isp to do remotely DLM resetted everydays soon. I work for BT in provisions/order management and a lot of the time we will still accept the order, and then we have to have the unfortunate conversation with the customer. It’s very annoying. They can join 1-15 home together with a small join then take smaller joins to homes wht should increase speeds,,, or next idea is made boxes WiFi node for v5 sytem,,, Virgin tried to use owner boxes for WiFi node, for home n for street.